Move over, Sriracha: There's a new condiment in town. Actually, the spice paste known as gochujang has been used in Korean cuisine for centuries, but it's showing up on more and more menus and ingredient lists stateside. Here's what you need to know about this intensely flavorful new pantry staple. What it is: Gochujang (pronounced "go-chew-jong") is a Korean condiment made from red chilies, rice, soybeans and salt; some producers add honey or sugar too. The traditional Korean preparation calls for gochujang to be aged in earthenware pots for a year or more. Because the soybeans are usually fermented, the spice paste has an earthier, more savory flavor that sets it apart from other spicy condiments. It's smoky, sweet, salty, and can range from mild to fiery—plus it has a big umami boost. What to do with it: Edward Kim, chef and owner of Chicago's Mott Street restaurant, loves using gochujang in grill-friendly recipes. "Gochujang works well with a lot of barbecue items," he notes. "Thin it down with water to get a saucy consistency, then brush it on grilled chicken for a glaze." Kim also likes to mix gochujang with chopped shallots, scallions, garlic and ginger to make an aromatic marinade. Or you can add honey or molasses, along with a little oil, to make a vinaigrette dressing. Be bold: Think of gochujang as Korean ketchup. 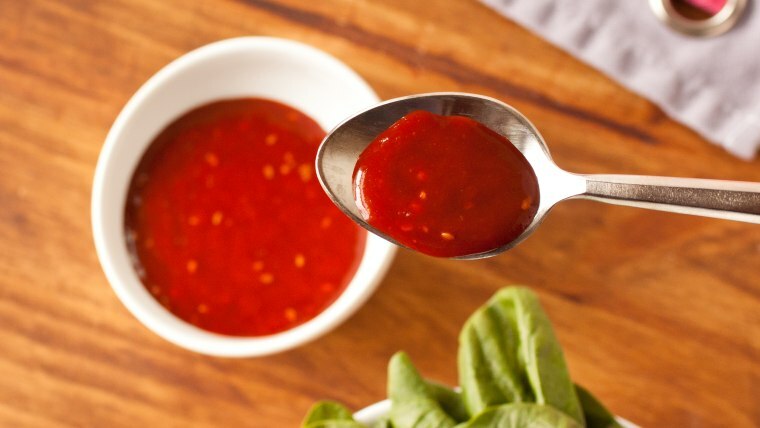 You can also try it with any dish or in any recipe where you would normally use Sriracha. "Don't be afraid to play with it!" Kim says. Where to find it: Though typically found in plastic tubs in Asian specialty markets, gochujang is now turning up in mainstream grocery stores and supermarkets coast to coast. Look for it in squeeze bottles next to the Sriracha and other Asian hot sauces.